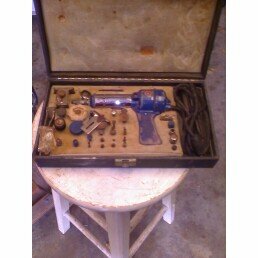 This was my Grandfathers and he died in 1957 and I was wondering if this is a drill or a dremel. Model No. 117 2102, serial no. 4350000, ac dc 110 volts, 55 watts, Sears Chicago all on a stamp on it and it still works good. I also have the Sears Craftsman Dremel/drill, s/n 4251000, Model #117 2102. I was also wondering if it has any collector's value. Hi Daryl, I just recently found my dads rotary tool identical to yours. Although the serial number is partially worn off and the cord is bad.I think it belonged to my grandfather at one time, judgeing by the copy write date in the owners manual of 1939. Since both are gone now I dont know for sure how old is actually is. I'm courious if its worth anything?